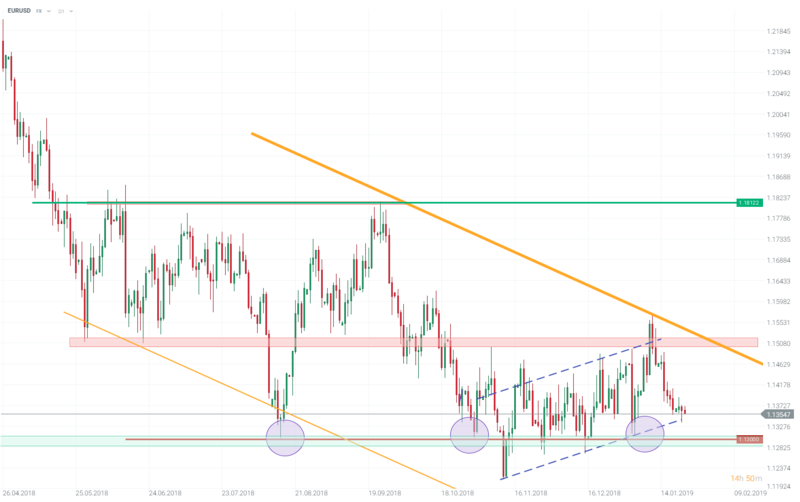 The EURUSD has been stuck in a tight range for the past 3 months as economic conditions deteriorated in both US and EU. Such long period of calm often resulted in big directional swings in the past. Could the ECB be the trigger? As economic conditions deteriorate bond yields decline both in the US and EMU. But the USD yields decline from a higher level so technically the US dollar has more to lose from the move. It looked as if it was about to happen when the pair cracked 1.15 but the a dovish speech from the ECB president undermined the euro. A bond yield spread line still runs much higher than the EURUSD but obviously there’s no guarantee this will translate into the EURUSD rally. Because of the US government shutdown the CFTC data on positioning have not been updated for a month now. Before that the positioning was tilted in favour of the dollar suggesting it could have more “to lose”. However, this is just one of many indicators. From a longer perspective the pair remains in a downward trend as we have a sequence of lower lows and lower highs. Within that broad downward channel we have seen a consolidation that could herald bottoming out but if this bottoming out fails, the last 3 months can turn into a flag pattern and result in a bearish impulse. Most importantly, as we head to the ECB meeting EURUSD buyers face the challenge of defending lower limit of the flag and the 1.13 level. It looks like the euro wasted some opportunities to move higher at the beginning of 2019. The ECB will have to admit that the economic situation has deteriorated but that’s already discounted by the markets and president Mario Draghi will stop short of suggesting any policy change. The biggest mover that we could imagine would be a hint at a possible return of the QE policy, something that EURUSD buyers hope will be avoided.